Australian’s all love a good sporting match; from Cricket to Rugby, AFL to NRL. The next time you are at a match cheering on your team, take a moment to look at the stadium you are sitting in and give a thought to those who were involved in the construction of this mega structure. This story is about the detail and sheer volume of equipment required to build one of these large entertainment facilities. 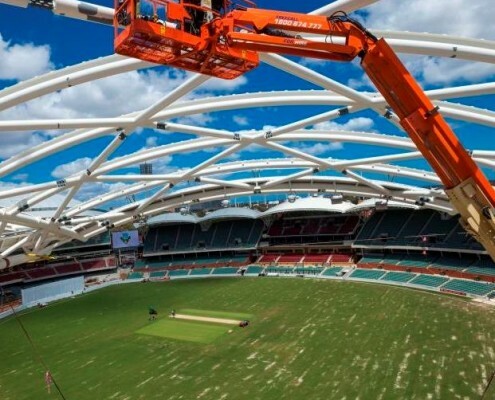 The Adelaide Oval project involved multiple contractors working together for over 18 months to get this project finished in time for the 2013/2014 Cricket season. 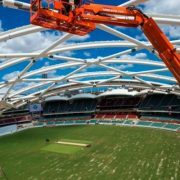 When it comes to designing and building an entire entertainment facility such as the Adelaide Oval there are many challenges which need to be tackled and planned in detail to ensure project goals are met, on time, on budget and safely. A challenge faced early on in the project life was for contractors Samaras and Ferrari Engineering who partnered with Force when they required a working at height solution in order to erect the Eastern and Southern stand including the roof, by November 2013. The equipment chosen would need to work from where the seating had already been placed in the stand. This was so the workmen would be able to reach to secure the steel in place to construct what was to make up the roof. As there was no elevated work platform with large enough working height which could reach from the grounds of the stadium to the roof of the stadium, it was up to Force to work with Samaras and Ferrari Engineering to find a solution. It was decided by Samaras that the equipment used would be used from plinths, custom manufactured for this purpose, which were strategically placed coming out from the stadiums allocated seating area. This was the best solution to ensure that the men required to secure the roof in place could reach the destined height safely. After initial meetings between Force and Samaras going through in detail what they required the equipment to do, including detail as to which machine had the right operating arcs and range of motion it was decided the best equipment fit for them would in fact be a Force, JLG 86’ Boom. This equipment would ensure the workmen could safely reach the working height required. The next process was to create a plan for how the boom lifts would safely be placed on each plinth which had been built specifically for them. It was decided that each machine could be craned into position, but in order to do this safely each machine was to have the counter weights removed, and re-attached once they were safely on their allocated plinth. For safety reasons Force also ensured that the drive function was disabled on every machine for the duration of the hire. Throughout the process there was continuous meetings to ensure Force had an overview at all times of how many machines would be required so that if needed Force could arrange for the machines to be moved from other branches across Australia for the project.